Congratulations to the winners of our 2016 End-of-the-Year Contest! One Grand Prize winner received all 40 of Carol Fitzgerald's Bookreporter.com Bets On picks from 2016, while eight others won a selection of five of these titles. You can see all the winners below, along with 2016's Bets On selections. 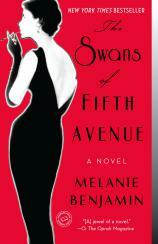 I read --- and swooned over --- THE SWANS OF FIFTH AVENUE by Melanie Benjamin. It’s a juicy story of the friendship between Truman Capote and socialite Babe Paley. Her friends, known to Truman as “the Swans,” included Slim Keith, C. Z. Guest, Gloria Guinness and Pamela Churchill. Paperback releases for the week of October 24th include THE GUEST ROOM by Chris Bohjalian, the spellbinding tale of a party gone horribly wrong --- two men lie dead in a suburban living room, two women are on the run from police, and a marriage is ripping apart at the seams; THE SWANS OF FIFTH AVENUE, Melanie Benjamin's novel about New York’s “Swans” of the 1950s --- and the scandalous, headline-making and enthralling friendship between literary legend Truman Capote and peerless socialite Babe Paley; THE ROAD TO LITTLE DRIBBLING, the much-anticipated follow-up to NOTES FROM A SMALL ISLAND, in which Iowa native Bill Bryson --- now a British citizen --- sets out again to rediscover his adopted country; and PACIFIC, Simon Winchester's biography of the Pacific Ocean and its role in the modern world.